Gov. Andrew Cuomo’s SUNY 2020 legislation is set to expire at the next academic year’s end, and with it goes a built-in program for predictable tuition costs that Stony Brook University’s Undergraduate Student Government, faculty and administration are working to save. Called rational tuition, the plan was passed in 2011 to give New York’s state and city universities a way to raise tuition by up to $300 each year for five years for in-state undergraduate students and up to 10 percent each year for five years for out-of-state undergraduate students. A presentation prepared by SUNY Associate Vice Chancellor for Government Relations Stacey B. Hengsterman shows tuition was raised at some institutions by as much as $950 in a year, a fact that influenced Norman Goodman, a professor and Stony Brook University senator, to favor SUNY 2020 since its inception. “The rational tuition policy is a reasonable approach to tuition,” he said in an interview. He continued, expressing his opinion that students deserve a free, quality education—preferably achieved for free—but that rational tuition is the next-best alternative. 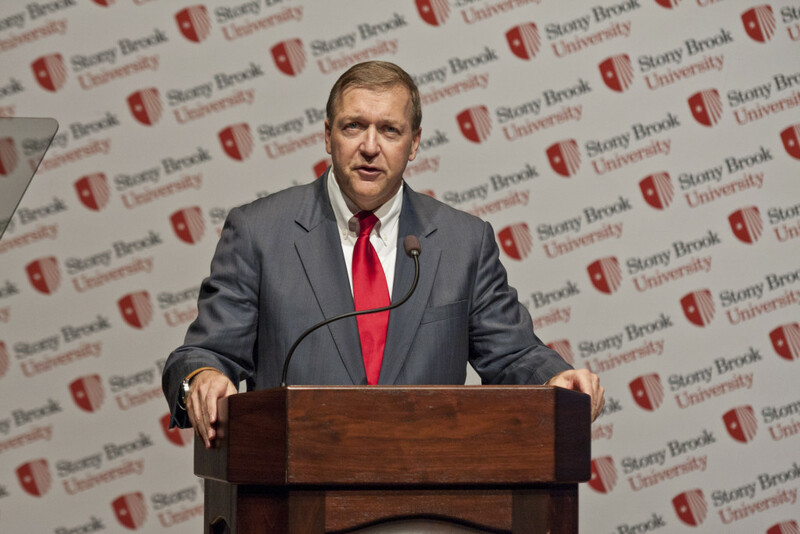 A list of Stony Brook-specific SUNY 2020 talking points shows that due to the legislation, Stony Brook improved the student-to-faculty ratio to about 25:1, $3.2 million in grants were awarded to over 9,600 students and 19 new degree and advanced certificate programs were offered. 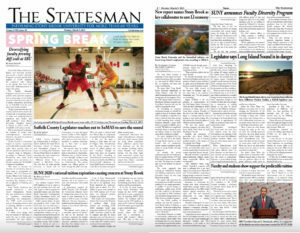 Both Stanley and Undergraduate Student Government Vice President of Academic Affairs Steven Adelson said extending SUNY 2020’s expiration would mean prospective students of New York’s public institutions would be able to compare and plan for future education costs, and the value of a Stony Brook degree would continue to rise while SBU would be able to continue to hire more faculty. Adelson cautioned, though, that if the legislation was not renewed, preferably before it expired, the state funding Stony Brook currently receives could be put in jeopardy. 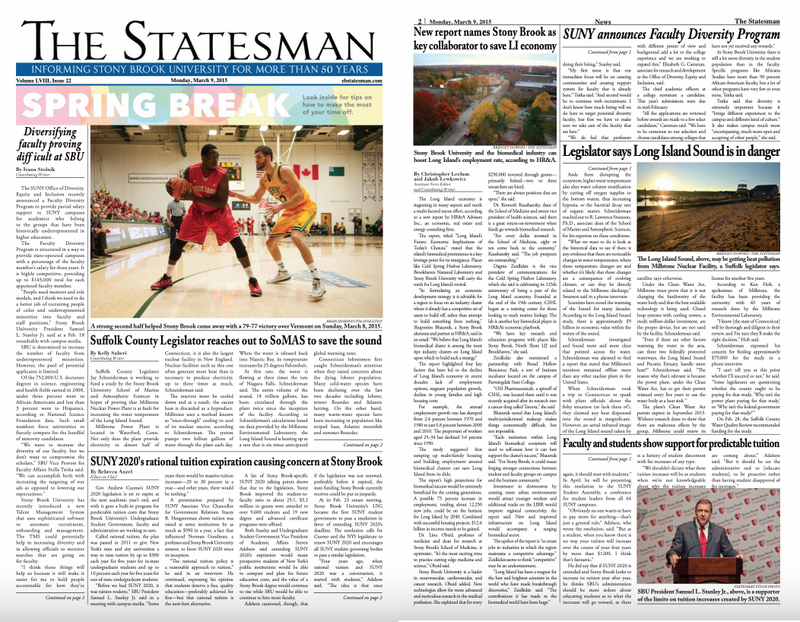 At its Feb. 23 senate meeting, Stony Brook University’s USG became the first SUNY student government to pass a resolution in favor of extending SUNY 2020’s deadline. The resolution calls for Cuomo and the NYS legislature to renew SUNY 2020 and encourages all SUNY student governing bodies to pass a similar legislation. The Statesman published this piece in print on March 08, 2015. “Four years ago, when rational tuition and SUNY 2020 was a conversation, it started with students,” Adelson said. “The idea is that once again, it should start with students.” In April, he will be presenting this resolution to the SUNY Student Assembly, a conference for student leaders from all 64 SUNY campuses. 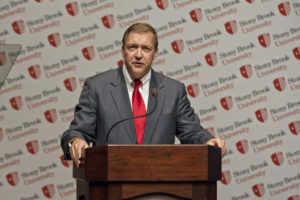 He did say that if SUNY 2020 is extended and Stony Brook looks to increase its tuition year after year, he thinks SBU’s administration should be more ardent about educating students as to what the increases will go toward, as there is a history of student discontent with fee increases of any type.